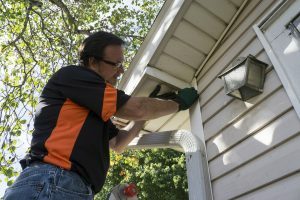 If you’re looking for a contractor to replace the siding on your home in Omaha, Nebraska, Elite Exteriors is the company to call. We’ve been serving homeowners in this area since 1995, providing expert siding installation services and a variety of premium siding options. From beautiful seamless vinyl siding to durable fiber cement “hard board,” and decorative “board and batten” siding, we have a number of top-quality products that will dramatically improve your home’s appearance and furnish it with unparalleled protection against the elements. Here at Elite Exteriors, we’ve earned our stripes. We are a Mastic Elite contractor and have also been certified by the Vinyl Siding Institute (VSI). As such, our factory-trained technicians have extensive knowledge of the different types of siding we offer and are qualified to install these products with unparalleled expertise. We have been recognized as a siding expert by KETV, the local news network in Omaha, and our dedication to providing our customers with the best products and services available has earned us a stellar A+ rating with the Better Business Bureau. If you live in the Omaha area and are interested in partnering with us for siding installation, contact Elite Exteriors today. We would be happy to answer any questions you may have.